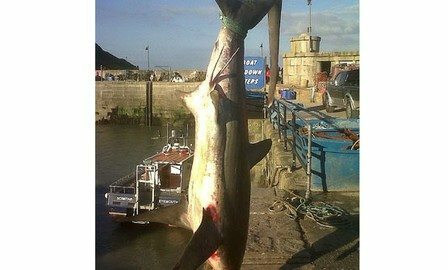 A fisherman got the shock of his life after accidentally catching a rare 320lb shark – just 100 yards off the British coast. Boat skipper Chris Glaves netted a massive 15ft thresher shark – which can decapitate a human with just a swish of its tail. Chris and his crew were fishing for seabass when the 320lb (144kg) shark was caught in their nets just north of Padstow, Cornwall. The shark – a relative of the Great White – was lurking thousands of miles from its usual home in the seas around Asia and North America. Luckily for the crew of the Good Intent boat the deadly thresher was already dead when it was brought onboard. But it drew a huge crowd when it was brought into Newquay Harbour and then again when it was sold at Plymouth Fish Market. Chris said: ”There was nothing that could have been done to rescue it. A shark needs oxygen to breath and it got wrapped up in the net which was too tight for it. The breed is considered a “vulnerable” species by the International Union for Conservation of Nature and Natural Resources.